When Megan Stack was living in Beijing, she left her prestigious job as a foreign correspondent to have her first child and work from home writing a book. She quickly realized that caring for a baby and keeping up with the housework while her husband went to the office each day was consuming the time she needed to write. This dilemma was resolved in the manner of many upper-class families and large corporations: she availed herself of cheap Chinese labor. The housekeeper Stack hired was a migrant from the countryside, a mother who had left her daughter in a precarious situation to earn desperately needed cash in the capital. As Stack's family grew and her husband's job took them to Dehli, a series of Chinese and Indian women cooked, cleaned, and babysat in her home. Stack grew increasingly aware of the brutal realities of their lives: domestic abuse, alcoholism, unplanned pregnancies. Hiring poor women had given her the ability to work while raising her children, but what ethical compromise had she made? Determined to confront the truth, Stack traveled to her employees' homes, met their parents and children, and turned a journalistic eye on the tradeoffs they'd been forced to make as working mothers seeking upward mobility—and on the cost to the children who were left behind. Women's Work is an unforgettable story of four women as well as an electrifying meditation on the evasions of marriage, motherhood, feminism, and privilege. MEGAN K. STACK is the author of Every Man in This Village Is a Liar, a finalist for the 2010 National Book Award. As a war correspondent for the Los Angeles Times, she reported from dozens of countries and was posted to Jerusalem, Cairo, Moscow, and Beijing. She was a finalist for the 2007 Pulitzer Prize in international reporting. "A stunning and layered examination of gender, money, and power . . . Unflinching." 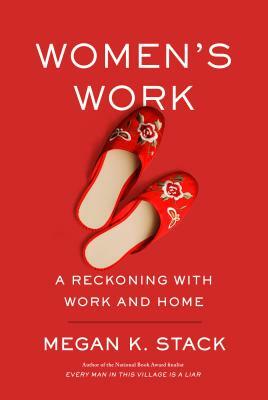 "Memoirs about motherhood are exceedingly common, but Women’s Work dares to explore the labor arrangements that often make such books possible . . . Stack writes sharp, pointed sentences that flash with dark insight . . . [A] fearless book." "Probing and fascinating. Stack doesn't shy away from describing her own feelings . . . Stack's writing is sharp and lovely."